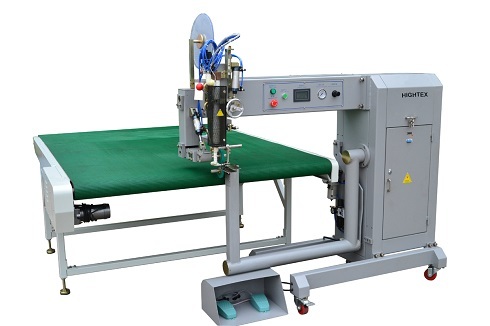 Hightex S700 Hot Air welding machine for inflatable products: this hot air welding machine can be used for the production of all kinds of waterproof makeup products with PU, PVC, TPU, PE, PVA coating. 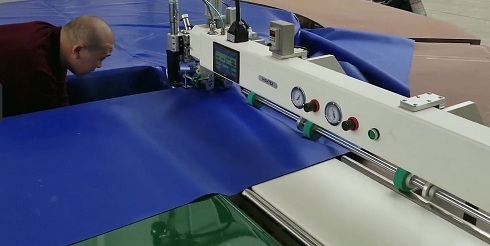 Ideal for inflatable boat manufacturers, camping tents, plastic and tarpaulins, inflatable games, inflatable castles, PVC ventilation hoses, flexible pvc air ducts, inflatable advertising and inflatable products. S700-1800EX hot air welding machine for Inflatable Pool: Custom made welding automation equipment with 1800mm clearance room under the arm, top and bottom feed + synchronously puller feeding system, photoelectric controller and synchronous rotating table. Ideal for the welding production of Inflatable Pools, Inflatable Swimming Pool,paddling pools (PVC), Kid Pools. Conceived for a single operator to work - no expert operator is required.